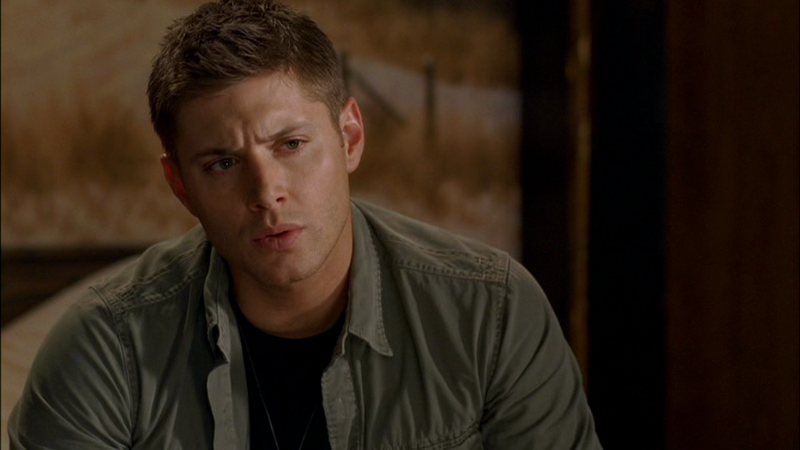 Dean really likes green shirts. As a fellow green-eyed person, I can relate. It does, however, make my job a little harder – because it can sometimes be difficult to tell the shirts apart. This shirt, I’ve deemed his “rugged” shirt. It has visible stitching and breast pocket flaps that do up with buttons. The pockets themselves have two seams running vertically down them. It sometimes looks beige, depending how much they wash out the colour in an episode. The crucial thing to note about this shirt is the double shoulder seam. It's really the only thing that distinguishes it from other shirts.. It sometimes looks beige, depending how much they wash out the colour in an episode. Actually, this shirt starts looking very beige in S6, it may in fact be two shirts. This shirt first appears for certain in Crossroad Blues (2x08). Dean wears it for the entire episode. In Tall Tales (2x15), Dean is wearing it in the flashbacks when he and Sam investigate the Professors death. He has changed by the time they investigate the alien abduction story though. In Sin City (3x04), Dean starts wearing it after Ritchie is killed and keeps it on until the demons are dead. He is NOT wearing it at the very end when he talks to Bobby though. In Fresh Blood (3x07), this is possibly the shirt that Dean is wearing from the beginning of the episode until he beheads the uninformed vampire girl. In A Very Supernatural Christmas (3x08), Dean wears this shirt from their first meeting with the Carrigans through to killing them. In Time Is On My Side (3x15), Dean wears it from when they start getting ready to hunt Doc Benton until the end of the episode (this includes his trip to see Rufus). In Good God Y’all (5x02), Dean wears when he and Sam are visiting Bobby in the hospital. In Dark Side of the Moon (5x16), this may be the shirt that Dean wears once they enter Sam’s memory of Flagstaff Arizona. He keeps it on for the remainder of his time in heaven, until his resurrection on earth. In Two and a Half Men (6x02), Dean wears the shirt from the beginning of the episode until after he meets up with Sam and the baby at night. It looks very beige in this episode. In Weekend at Bobby’s (6x04), Dean might be wearing this shirt when he and Sam call Bobby from the park, and ask him to help them identify the monster. 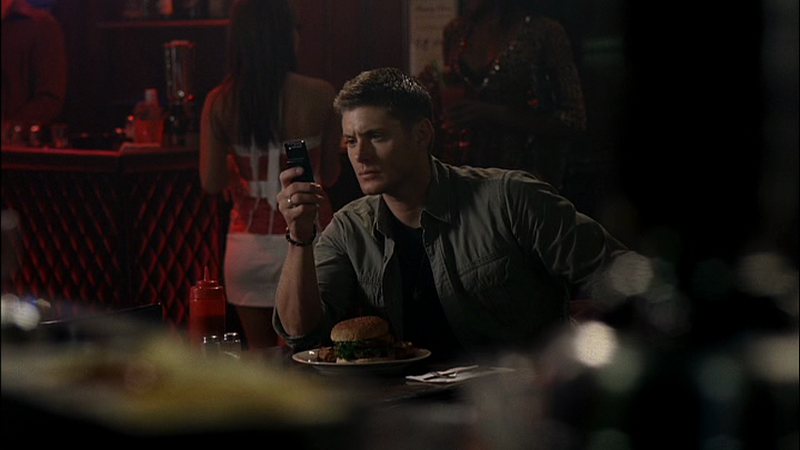 In Unforgiven (6x13), Dean is wearing this shirt when he and Sam arrive in Bristol and eat in the restaurant. He wears it back to the abandoned house to pack up, but then Sam convinces him that they should work the case, and Dean puts on a suit to go interview people. 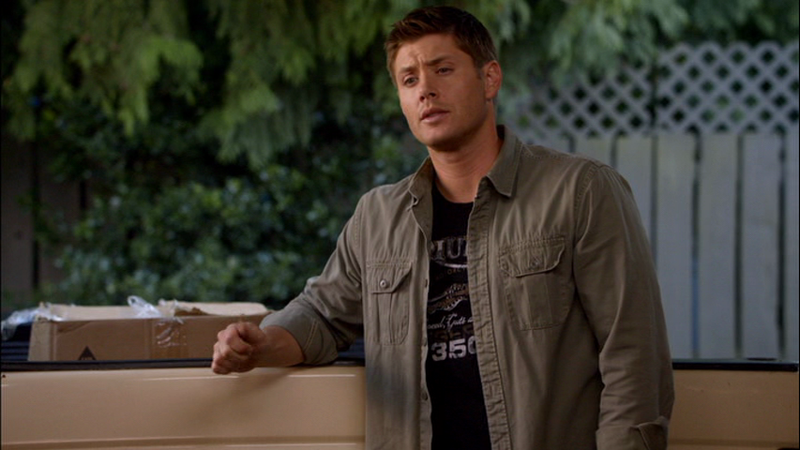 This might be the shirt that Dean is wearing in What’s Up, Tiger Mommy? (8x02), when they go to the auction. This might be the shirt that Dean wears at the end of Hunteri Heroici (8x08), when the Winchesters leave Castiel to watch over Fred for a few days. This might be the shirt that Dean wears in I’m No Angel (9x03), when he and Sam go to the homeless camp under the bridge and then to Detroit, as they try to track Cas down. In Holy Terror (9x09), Dean wears this shirt when he and Sam are back at the bunker after they’ve had beers with Castiel and Dean has once again forced Cas to leave. He wears it until the church youth group is killed. In LOTUS (12x08), this MIGHT be the shirt that Dean is wearing when they leave the Bunker to go and try to defeat Lucifer. He wears it until the end of the episode. In First Blood (12x09), this might be the shirt that Dean is still wearing at the beginning of the episode when they are carted away to a top secret prison. FATE: In First Blood (12x09), their clothes are taken from them when they are imprisoned and they are given jumpsuits to wear.